At the Paleo game, children move with their body a prehistoric man or woman left or right who exists in a prehistoric world in order to collect falling objects thus answering cognitive or math problems. There are also various types of stimuli (numbers, food types, bombs, bottles with liquid related to stamina and to resistance to bombs), which are presented randomly. 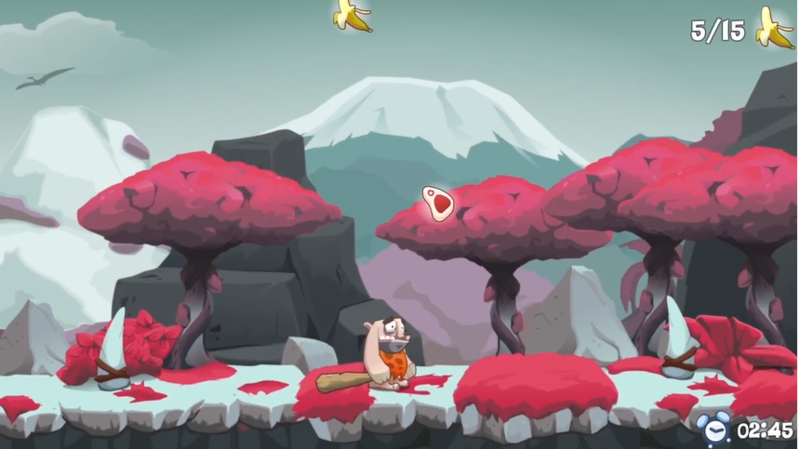 The teacher can make this game as challenging as needed depending on children’s abilities by choosing among several levels of difficulty with regards to the speed of the falling objects or bombs that are being dropped by dragons and need to be avoided or even dinosaurs which are hungry and move towards the prehistoric man or woman. Children must make coordinated movements and avoid dinosaurs and falling bombs. They are called to respond only to correct falling objects (go stimuli), and to inhibit their responses to bombs or unrelated objects (no-go stimuli). Thus, this game strengthens children’s cognitive ability of response inhibition and improves their executive attention and reasoning ability. Reasoning ability heavily depends on inhibitory control, i.e., blocking information irrelevant to the target and ignoring irrelevant environmental distractions.